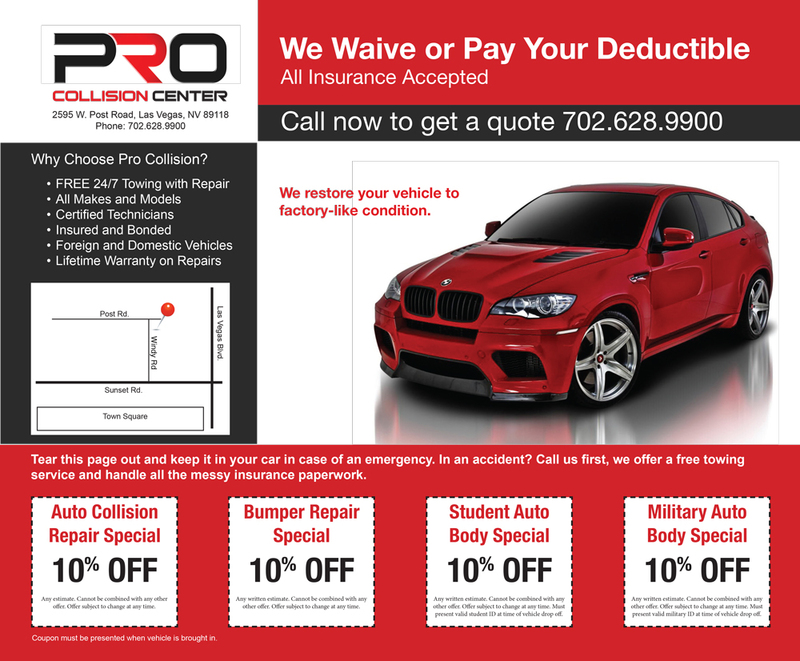 As your premier auto-body repair shop with over 16 years of experience, Pro Collision Center handles all collision repairs promptly meeting the highest quality standards with the latest technology and tools available. From Aluminum Repair to Frame Alignment and 1-Day Bumper Repair, we cover it all. We strive to repair your vehicle to pre-accident condition or better! Offering certified technicians equipped with the expertise to repair domestic and foreign vehicles like new, Las Vegas Collision Center delivers top-notch service while striving to provide the highest quality for all collision repairs. Free Estimate! – Request One Now! Once the insurance company has received the estimate, it is reviewed and a determination is made as to whether or not your vehicle is worth repairing. It is possible that some negotiation will occur regarding the exact procedures to be completed along with the prices that the insurance company is open to accepting. In order to assess the nature of any hidden damage, your vehicle is disassembled and inspected. If additional repairs are necessary, your insurance company is contacted again for review and approval. Our staff determines which parts are needed to complete the repairs, checking for availability, and ordering those that are not currently stocked. Since the repair process cannot begin until necessary parts have been obtained, they are ordered quickly. Our technicians work diligently to restore your vehicle’s structural integrity back to factory specifications. In order to ensure an accurate repair for the frame of your vehicle, our technicians utilize a computer-operated measurement system in conjunction with specialized equipment that delivers precise factory-standard re-construction of your vehicle. 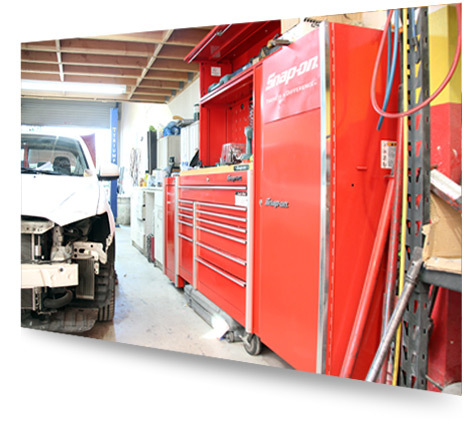 Your vehicle begins to look like itself during this next stage of body repair. Our specialists complete all metal finishing, replacing exterior panels as needed. All sheet metal is properly aligned and installed so that your vehicle is returned to its pre-collision appearance. The paint-preparation phase involves several stages. First, each panel is properly prepared for paint application. Then, the panels are primed and sealed so that they offer strong adhesion for the top paint color as well as for the clear coat that is applied. Our VIP paint treatment is the best you’ll find anywhere. During this phase, your vehicle is put back together so that it is nearly ready for you. All components and moldings are restored to their initial location in preparation of the final stage. After fully cleaning your vehicle from dust and debris accumulated during the repair process, our technicians complete a thorough inspection to ensure that everything is in order. This is the final phase, during which our staff makes sure that your vehicle looks good as new and road worthy. We Pay Your Deductible!. Call us or Request a Free Quote for more information! own shop and your insurance company is required to advise you of that right. your vehicle will be restored to factory specifications. Body shops work directly with insurance companies, so obtaining multiple estimates is not necessary. Select a shop that provides you with a written warranty of their work. Estimates vary from one shop to another, we will explain in detail what the differences are if you already have an estimate at hand. items on the repair order such as, Sublet Work, or Sublet Labor, are subject to the guarantee of those suppliers. negligence, abuse, or misuse. Specifically excluded from this limited warranty is rust through metal scratches, gravel or rock chips to paint. flaking, or deterioration. This shop will, at its sole option, repair and re-paint any metalwork warranted. applied over original factory finishes that are free of factory defects. Parts: Pro Collision Center guarantees that pars or materials used by us are of top quality. equipment manufactured parts were not used without authorization from you as noted on your repair order. re-repair any mechanical assembly or component warranted hereby. components resulting from a defective part of installation of such part installed or repaired during the repair included in this warranty. by Pro Collision Center. This warranty is not transferable.